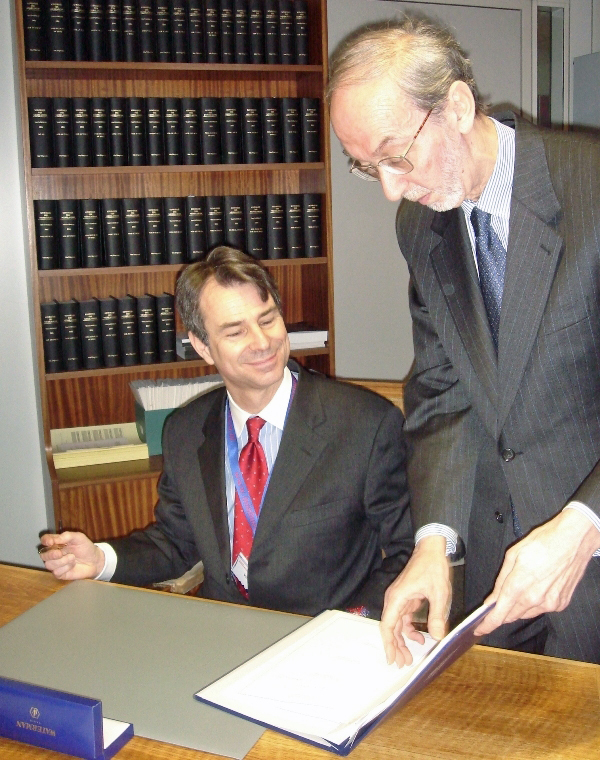 On Monday 19 January 2009, the Hague Convention of 30 June 2005 on Choice of Court Agreements received its first signature. Mr John B. Bellinger III, Legal Adviser to the US Secretary of State, signed the instrument of signature on behalf of the United States of America. Ms Karen K Johnson, Deputy Legal Counselor of the US Embassy at The Hague, as well as HCCH Secretary General Hans van Loon and Secretary Marta Pertegás attended the short ceremony at the Ministry of Foreign Affairs of the Netherlands. The Hague Convention of 30 June 2005 on Choice of Court Agreements was acceded to by Mexico in 2007 and awaits a second ratification or accession to enter into force.